This rug is absolutely beautiful! Reminds me of ocean and sand which fit our decor perfectly. Looks great with our wood floors and denim furniture! 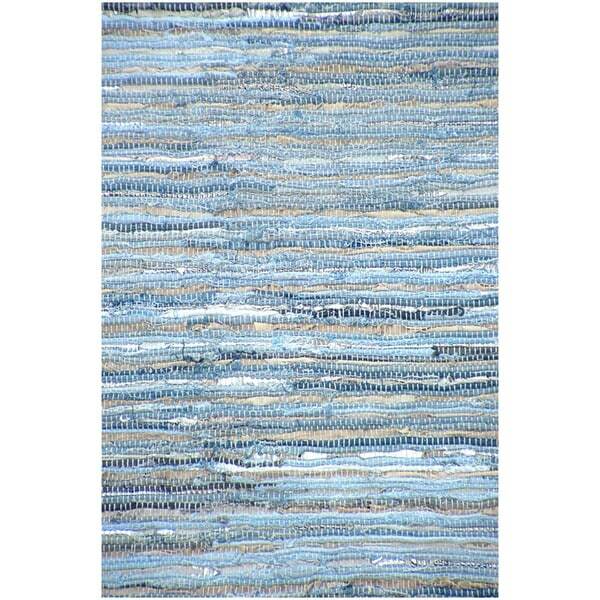 This flatweave rug is handwoven of an easy-to-clean leather and cotton weave that prevents shedding, unlike wool. 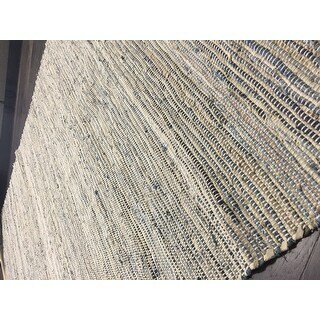 This Handwoven Denim Leather/ Cotton Flatweave Rug is flat woven which means that they do not have a pile. I've changed my 1 star review to four stars. The color of the rug is still not as blue as the picture in the preview (which was my complaint) but I've gotta say that it looks great in my living room. I'm happy with it. Exactly the same as advertised. Perfect rug for our beach house. Love the colors and the feel. I did have to put carpet tape under one corner that just insists on curling but it's perfect in my white tile floor. "Are there fringes on this rug? It looks like the photo is just showing a swatch of the rug, rather than the entire rug, so I can't see what the edges look like. I want something that I'll be able to vacuum and fringes get in the way." This rug does not have fringed edges. under the table in the kitchen, it will hide the dog hair well! The size is good for my needs, the fabric and color is perfect for my room.